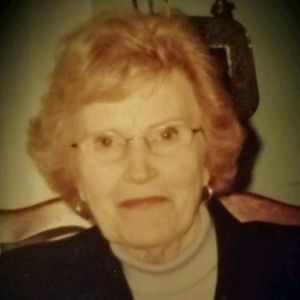 Vida Lee Ammons Cox, 95, of Clarkton, NC died peacefully at the Angel House of the Lower Cape Fear Hospice on April 4, 2019. Vida was born March 14, 1924 to William and Della McKee Ammons of New Hope. She had two siblings Mona Ammons Smith and A.R. "Archie" Ammons, the poet, of whom she was very proud. She was married to the late Allen Wilson Cox of Clarkton. She is survived by her three adored sons Allen Wilson Cox Jr., John Herbert Cox (JoAnn) and William Jeffrey Cox (Susan), all of Clarkton. Vida has three much loved granddaughters: Carey Cox of St. Petersburg, FL; Molly Cox of Raleigh, NC and Mariah Cox of Lynchburg, VA.
After graduating from Whiteville High School, Vida attended Nursing School at High Point Memorial Hospital and graduated in 1945. She spent her life in various aspects of nursing serving in the hospital, doctor offices, and as a Bladen County School Nurse for many years. Vida was a member of Clarkton Presbyterian Church where she served as an elder and as Moderator and various other offices of Presbyterian Women. She was also a charter member of the Clarkton Woman's Club. She spent her life cooking for and serving her family, her church family, and the Clarkton community. In 2014 she was recognized as a Faithful Saint by the Presbytery of Coastal Carolina. In lieu of flowers, memorials may be made to Clarkton Presbyterian Church, Lower Cape Fear Hospice Angel House, or the Reuben Brown House Preservation Society. A celebration of Vida's life will be held on Saturday, April 13 at 2 pm at Clarkton Presbyterian Church with visitation following in the fellowship hall. Add your thoughts, prayers or a condolence to Vida Lee's guestbook.